Comments: Zachariah Fleming Jones was born August 28, 1846, in Virginia, and was the son of Benjamin Haden Jones, Jr. and Mary Winifred (Tillman) Jones. By 1860, Zack was living with his parents on the family farm two miles north of Scottsville. When the Civil War began, Zack was a teenager, who itched to join the Confederacy. Finally, Zack enlisted in Company D, 43rd Battalion Virginia Cavalry, Mosby's Command in 1864 at the ripe old age of seventeen. He was involved in considerable action in northern Virginia with Mosby's Rangers, having his horse shot out from under him on numerous occasions. After Lee's surrender at Appomattox, Mosby disbanded his command, and Zack was paroled at Columbia, Virginia. Zack returned to the Jones family farm near Scottsville and helped his father, a miller, work the land. By 1880, Zack had added the occupation of drummer to his work skills and traveled around the local area to sell various manufactured farm products. It was during his drummer days that Zack met his future wife, Cornelia Ann Crew, who was the daughter of Peter Joel and Virginia (Bowen) Crew of Richmond. Cornelia was born on January 22, 1855, in Virginia. Zack and Cornelia were wed March 2, 1881, in Richmond, Virginia. In 1897, Z.F. Jones purchased a lot of three acres situated in the "western suburbs" of Scottsville from Sallie A. Doll. A frame house (shown at left) sat on the Jones' property known as "Breezy Point"; portions of the house and its out-buildings pre-dated the Civil War. Zack paid $1100 for the property, which was bounded on the north and west by the lands of Geo. W. Clark, on the east by the land of Beal brothers, and on the south by a roadway that now runs into Byrd Street. Although he continued to work his farm two miles north of Scottsville, Jones and his family lived at Breezy Point for the rest of his life. As Zack worked on his farm and sold manufactured products around the countryside as a drummer, he began to envision time- and labor-saving devices that would prove useful to local farmers. Zack was very creative and skilled with his hands -- what he designed, he could build. In 1887, the U.S. Patent Office in Washington, D.C., issued Zack a patent for a nut-lock that simplified and strengthened the existing method of bolting railroad rails together. In 1890, he was issued an U.S. patent for his improved wagon body design that permitted one man to take apart and put together an entire wagon; the design also permitted the dismantled wagon to be stored in a small space. Other patented inventions by Zack were a plow protector (1895), an improved heel for shoes and boots (1906), an improved firebox and grate for home stoves (1912), safety devices for guns (1913), and an improved iron farm gate (1914). As a young boy, A. Raymon Thacker recalls watching a demonstration of Zack's farm gate: "Mr. Jones invented a gate that was pivoted and controlled by weights so that you could pull up in your buggy or surrey, pull a rope, and the gate would swing open. You would drive your buggy through the open gate, pull another rope on the other side, and the gate would swing closed. A number of these gates were used in the Scottsville area in those days long past." Zack either manufactured his inventions or sold the right, title, and interest in them to hardware stores in Scottsville as well as in other parts of Virginia and out-of-state. He never struck it rich with his inventions, but even in his eighties, Zack never gave up hope of devising another labor-saving and cost-effective tool. In 1928, Zack became very concerned about the safety of people living in second and third story buildings, such as Scottsville's Traveler's Rest Hotel. Out came his drawing board, paper, and pencil as he envisioned a fire escape apparatus. Again A. Raymon Thacker was witness to Zack's invention from concept to implementation: "Mr. Jones invented a fire escape which consisted of a rope, a metal hoop to sit in, and a hand control mechanism to control your speed coming down the rope. You would tie the rope to something substantial in the room, throw the rest of the rope out of the window, clamp the control device with the hoop to the rope, and gently lower yourself to the ground. He was so sure that his invention was perfect that he got Mr. Jackson Beal's permission to display it from the second floor of the Beal Building (in 2005, Scottsville Emporium on Valley Street)." "A large group of us watched the experiment. Everything worked fine to begin with, but about the time Mr. Jones got to the ceiling of the first floor, the spring in the control unit broke and as I watched him hit the ground, I am sure Mr. Jones bounced back from the sidewalk two feet. Fortunately, he was not seriously hurt, but I am sure he had difficulty sitting down for several days." Undaunted by the accident, Zack went back to the drawing board to tweak his design. 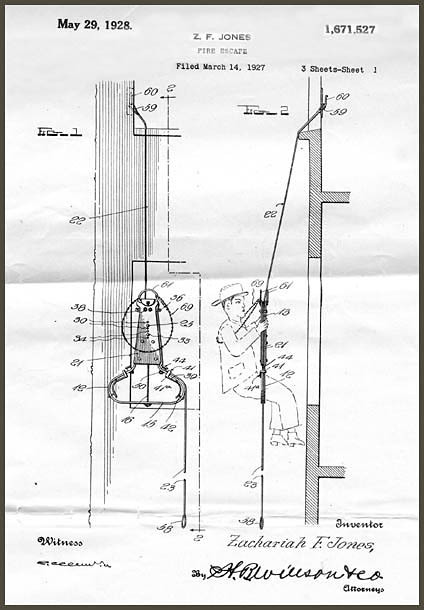 Below is Zack's own drawing of this fire escape, which was granted a U.S. patent on 27 May 1928. (1) Mary Virginia Jones was born February 22, 1884, Albemarle County, VA; she died December 7, 1967, VA; buried at Scottsville Cemetery. 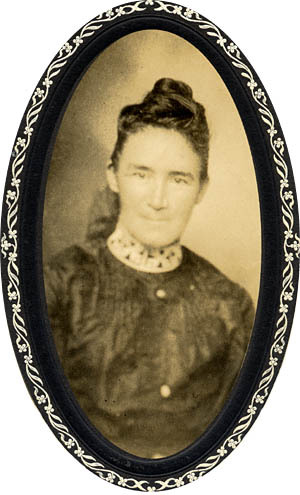 Mary was a charter member of the Scottsville Chapter of United Daughters of the Confederacy, which was organized on July 31, 1908. 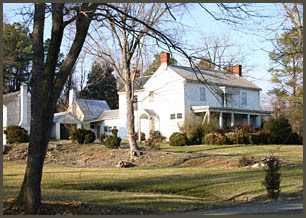 Upon her mother's death in 1918, Mary and her sister, Annie Warren Jones, inherited Breezewood, the Jones family home in Scottsville. Miss Mary Jones lived with her father and kept house for him until his death in 1932. She was well known in Scottsville where she often tutored students to catch them up in their classes. 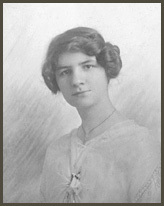 Mary also served as a Sunday School teacher at the Methodist Church for fifty years. Mary married Edward Oliver Clements (1868-1952) later in life; the Clements had no children. Mary Virginia and Edward Ollie Clements lived in Scottsville next to the Thacker Brothers' Funeral Home on Valley Street. Mary V. (Jones) Clements died on December 7, 1967, and is buried at Scottsville Cemetery, Scottsville, VA.
(2) Benjamin "Bennie" Crew Jones was born September 7, 1887, Scottsville, VA, and died on January 27, 1946, in Charlottesville, VA. For several years, Bennie ran the Scottsville Furniture store and Funeral Service. Later he operated the Beverly Hotel in Staunton, Virginia. Bennie married Lena May Holt of Staunton, and they were the parents of three children: Mary Alice, Marian Crew, and Ben Ray Jones. 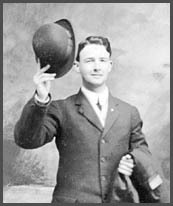 (3) Robert Dameron Jones was born on May 28, 1890, in Albemarle County, Virginia. He married Mary Anne Paulett of Scottsville on August 21, 1919. Mary Anne was a teacher who taught school at Clifton Forge. Robert worked as a butcher and clerk in a Scottsville market located next to the old Post Office on Main Street. Later, Robert and Mary Anne moved to McDonough County, West Virginia, during the mine wars. Robert worked as a company clerk in the company store and was in charge of weapons. Later he became an ATF agent in charge of finding alcohol stills. Robert also worked as an insurance salesman before moving to the Post Office from which he retired. After his retirement, Robert became a 33-degree Mason and established the first Lion's Club in Charleston, West Virginia. Robert's grandson, Robert Ash, said his grandfather "liked to be busy." Robert died in 1968 in West Virginia. Like his father, Robert, also was an inventor with several patents to his credit. Robert and Mary Ann Jones were the parents of one child, Cornelia Ann Jones, who married Bertrand D. Ash. (4) Annie Warren Jones was born on October 3, 1893, in Scottsville, Virginia. Annie also was a member of the Scottsville Chapter of the UDC. She married Frederick Dunn Starritt, and they were the parents of Frederick Dunn,Jr., Zack Benjamin, and Katherine Virginia Starritt. 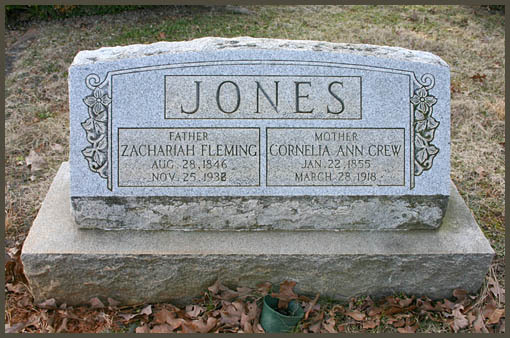 Cornelia Crew Jones died on March 28, 1918, and is buried at Scottsville Cemetery. Her husband, Zack, continued to live at Breezewood with his daughter, Mary Virginia. Zack lived an active life and in his mid- eighties decided to paint the roof of Breezewood. At the time, A. Raymon Thacker was standing in the school yard next door and observed Zack standing on the roof of his two-storied home: "Mr. Jones with his silver white hair was on the roof of his home and painting it with old paint. I was in high school at that time and was out on the school yard, looking at Mr. Jones on the roof. Suddenly, the safety strap holding him on the steep roof broke, and he fell two stories to the ground. I ran over quickly and found Mr. Jones in a pile of brick, covered in red which I thought was blood. Fortunately, the red turned out to be red paint. I helped get him up and into the house, and for poor Mr. Jones, it was the end. He never recovered from that fall but lived on for a year or so as a helpless cripple, cared for by his daughter, Mary." On November 25, 1932, Zachariah Fleming Jones died in Scottsville and is buried beside his wife, Cornelia, at Scottsville Cemetery. The photos of the Jones family and the fire escape patent are part of the Robert Ash collection. 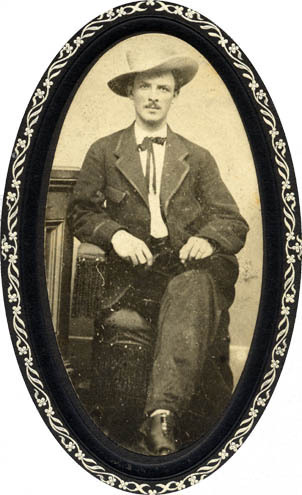 Robert is the great grandson of Zachariah Fleming Jones and resides in Rock, West Virginia.